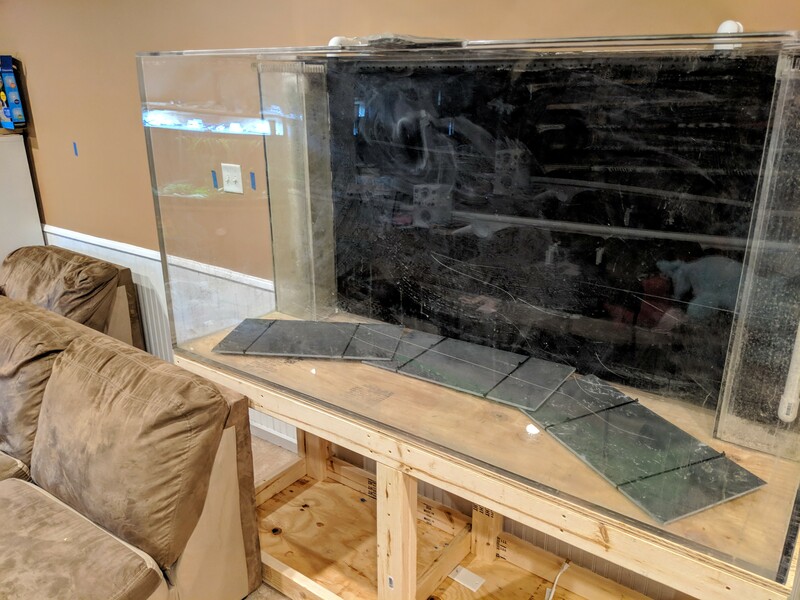 I recently bought a 280 gallon (72' long, 24" deep and 37" tall) acrylic aquarium to replace my 92 gallon corner aquarium. Plan on keeping it low tech due to the size and lack of a ton of time to maintain it (I have a busy job and 3 kids). Right now I am in the planning stage. I have to build a stand, get lights, build a canopy, plumb it, etc. The plan is to move a sectional to where the current tank is in my family room from where the new tank will go. 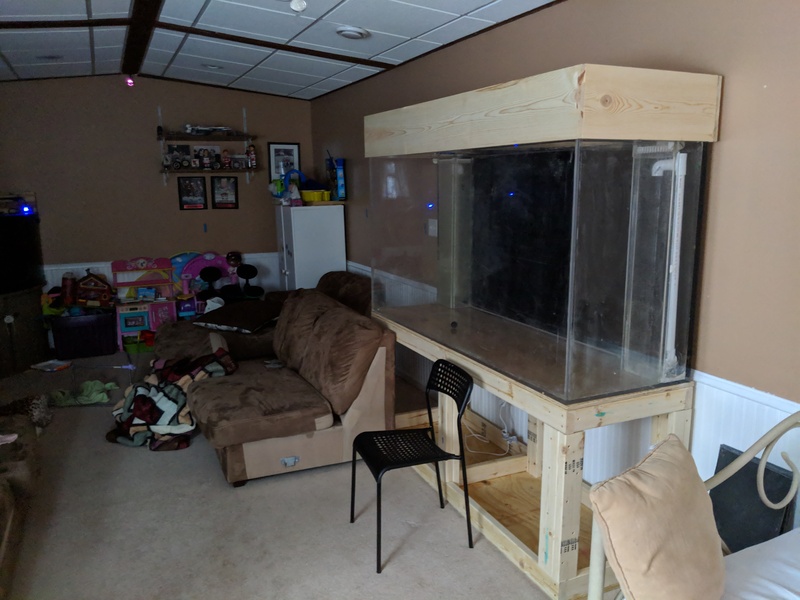 Since I will want to keep the old tank up and running until the new is ready, I want to get the transition done with as little transition time that includes a stacked sectional in the room to minimize the loss of spousal capital that I have remaining. The filter will be a wet-dry and sump in the next room. The wet-dry came with and external pump and a Ocean Clear canister filter. I will replumb the return system so that I can take the canister offline for maintenance when needed. I plan to have it plumbed to my water supply and have nearby drain so that I can automate water changes. For lights I am planning on probably going with at least four 50 watt LED spotlights from Amazon. Stand is planned to be a simple 2 by 4 DIY, wrapped in beadboard to match the existing wainscoting. Will update as things move along. Greggz, chayos00, Quagulator and 1 others like this. Last edited by Bunsen Honeydew; 03-10-2019 at 09:04 PM. I am looking forward to seeing this. 280G is a LOT of tank. Sounds like you will have your hands full getting it going, a lot of projects there. And like mentioned above, pics not showing up. 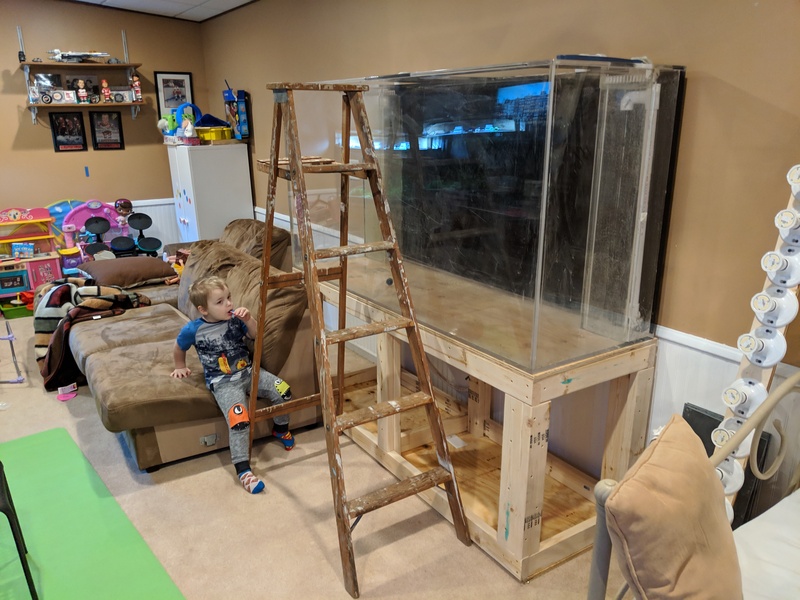 I am going to try to get the aquarium inside and cleaned up this weekend. After that I will evaluate it to decide whether I need to do any buffing. I'll also try to get moving on the plumbing. Only one of the overflows is actually drilled, because reasons. ¯\_(ツ)_/¯ I will drill that and add a bulkhead to mirror the other. I'll probably just put a Durso in each overflow. The return was a hole in the top bracing that had two of the movable nozzles. I think that I will again mirror the existing hole and make a spray bar and paint it black. If I can get that done this weekend and order parts for lights, I will try to get the stand, canopy and lights built next weekend and maybe even get the tank wet the weekend after. I got a canopy started yesterday, and decided to start the morning with a light build before the kids got up. Decided on 12 16W A19 bulbs with the diffuser cut off. 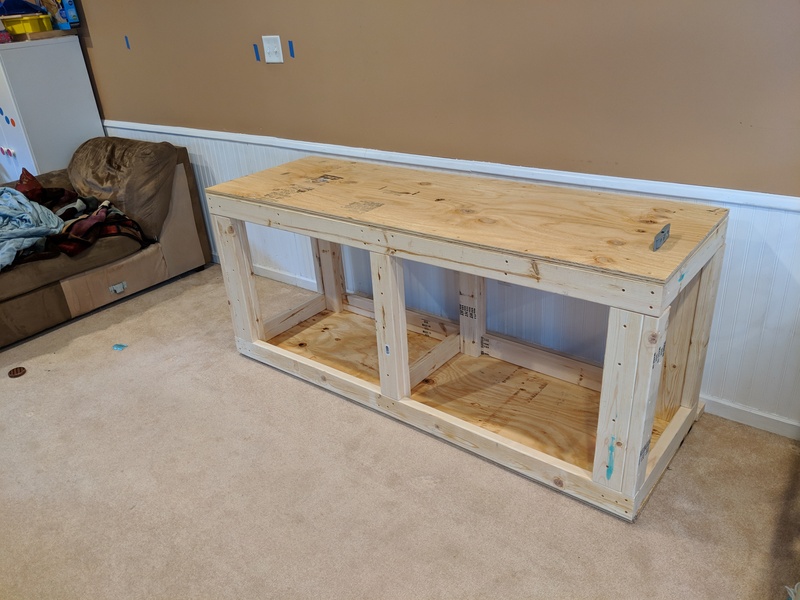 Took about an hour and a half to put together and only cost about $50. Greggz, chayos00, Quagulator and 2 others like this. Making progress. 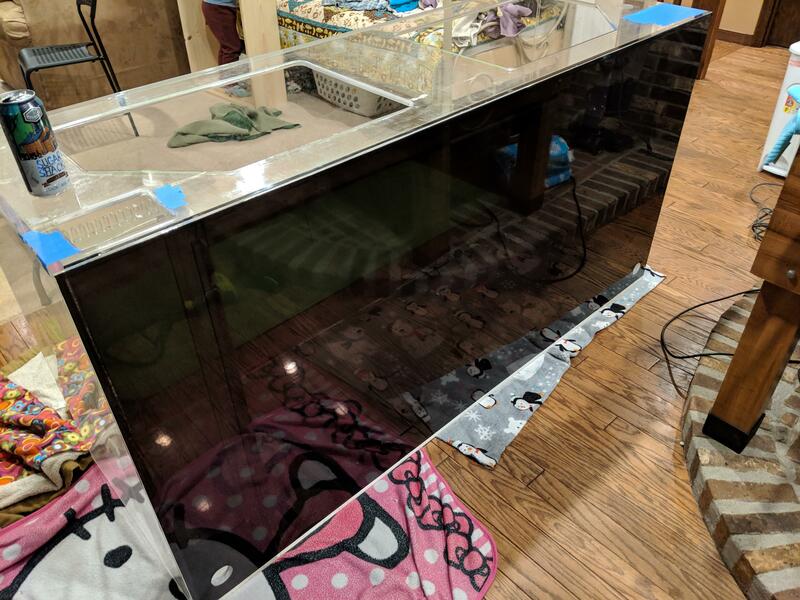 I got some black privacy film installed on the back of the aquarium, built the stand (roughed out anyway), and go the tank on and drilled the holes in the wall for the drain. I am going to try to finish the plumbing tonight and start laying out the scape tonight while that cures. Starting to think that the tank might be a little large for the room, though I am not about to admit that to the wife. The room really doesn't work with both tanks up, so I will need to get stuff moved, then work on cleaning up the acrylic. It took a beating during the move and subsequent kids playing in it. chayos00 and stevewb like this. That is an awful lot of weight on the floor of what looks like a mobile home. Its actually the family room in my bottom level walkout. I am fairly certain that the concrete slab can handle the weight. Bump: Progress on getting the plumbing done. Have the lines mostly done, just nee to tear apart the portion attached to the wet dry. 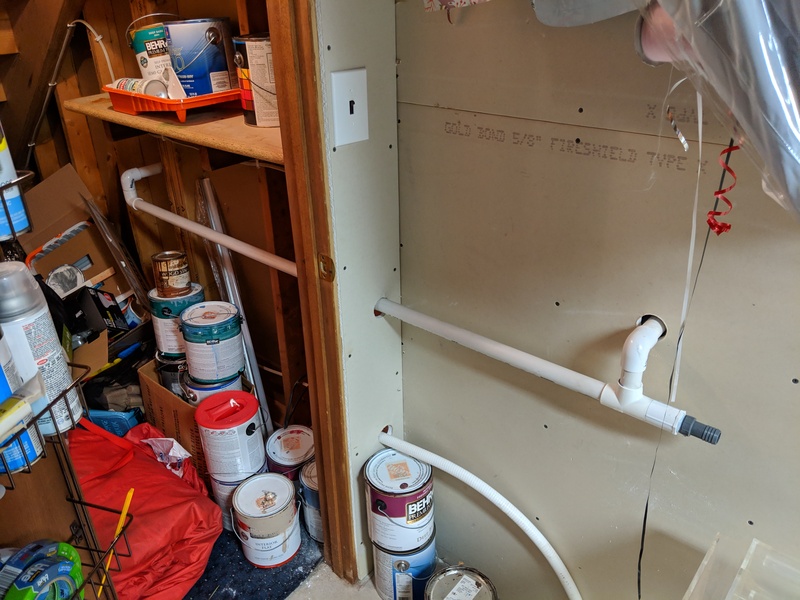 I am going to reverse the bulkheads to give more vertical drop on the drain, and attach the filter to the drain with flexible tubing. I had to get a step ladder out to reach down to the bottom of the tank, and at one point to climb in. A chair isn't cutting it for this one. Whatever goes in this tank is likely staying there, lol. Also put some zip ties around pieces of slate so that I can attach driftwood to them. I bought a bunch of dry driftwood a couple of years ago and some still isn't completely water logged, so I will attach the wood before I add the substrate. Speaking of substrate, I have 6 bags of black sand in my car for this. Greggz, chayos00, Immortal1 and 3 others like this. Nice can't wait to see how it turns out! Sorry I wasn't trying to offend. From the pictures that were posted the size of the room and the ceiling looked a lot like a mobile home. chayos00 and Snotrocket like this. Definitely going to be difficult to maintain with that tank depth. I have to stand on a chair to reach the bottom comfortably in my 24" deep tank and I am 6'1". You will probably have to become adept at using long tools. Regardless of this. I do envy your tank. Picturing the vertical element that this tank would provide for stem plants. Your stand looks very well built. This is a huge factor in a tank this tall as vertical height contributes more than anything to the load requirements of a stand.